The main map can be panned by simply holding down the mouse button and dragging around. Zooming can be achieved by either using the zoom bar in the top left of the map or by using the scroll wheel on your mouse. To zoom in quickly to a selected area, hold down the Shift key and drag your mouse to draw a rectangle on the map. The map will then pan and zoom the the selected area. Pinch zoom gestures are also supported on touch screen devices such as smart phones and tablets. Once the chosen area of the map has been identified, clicking a point on the map will highlight the area covered by the selected soilscape region, as pictured below. 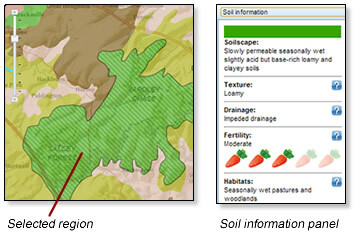 Additionaly, the attributes for this soilscape will be retrieved and displayed in the right hand Soil information panel. Search functions can be accessed from the Search tab in the right hand panel, or by using the Search link in the main site menu above. If you know the Latitude and Longitude of the location you are searching for, or the UK grid reference, you can enter these to pan and zoom the map directly to your desired location. Alternatively, using the Place/postcode search option will bring up a list of results for you to choose from. Once the desired area has been located, select the Soil information tab in the right hand panel or click the View soil information link in the search results pop-up box to return to the detailed soilscape description. If you are using a mobile device or HTML5 enabled browser, you can use the Get my current location button at the top of the search pane to automatically pan and zoom the map to your current location. Note that accuracy from fixed PCs or devices without GPS capability may be variable. GPS-enabled devices require a clear view of the sky in order to achieve maximum accuracy. Pressing the button a second time on GPS-enabled devices, after a few seconds, can often improve accuracy. 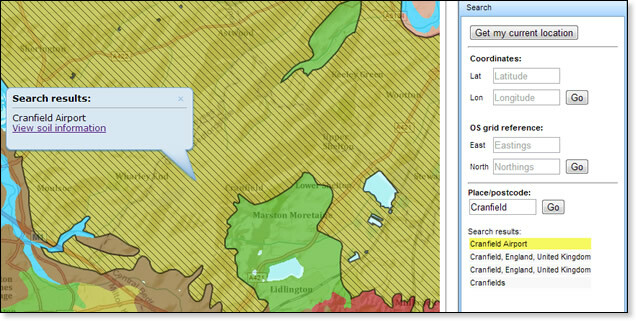 A basic legend, listing the range of soilscapes and colour codes is available via the Legend tab in the right hand pane. To view the full details of all soilscapes in full, select the Soil descriptions page from the main menu above. As this site is currently at the prototype phase, layouts and interfaces for mobile and touch screen devices are currently still in development. The site may therefore not currently display correctly on these devices.